Today’s Gran Premio Movistar de Aragón proved to be the most action-filled race of the season so far, as Movistar Yamaha MotoGP rider Jorge Lorenzo fought off his rivals to secure a hard-fought second place. Teammate Valentino Rossi also used his YZR-M1 to the fullest to fend off the competition and secured the fourth double podium of the season for the Factory Yamaha team. Lorenzo didn’t let a crash in warm-up this morning hold him back in today’s race. The local hero had a brilliant start from third on the grid and fought for the holeshot with Marc Marquez. Maverick Viñales soon joined the fight for the front, beginning a Spanish duel that had the race fans on the edge of their seats. A flurry of activity followed that saw Lorenzo finish the first lap in third position, closely followed by his teammate. A mistake by Marquez two laps later made Lorenzo storm to second place and he continued to claw his way to Viñales, but he had to let his teammate past. The top three riders briefly formed a leading group as they upped their pace, dropping low 1’49s laps. However, Marquez was closing in and with 17 laps remaining he found a way past Lorenzo, but the Mallorcan wasn’t fazed. He made his experience count and waited for the right moment to fight his way back to the front, which came with 14 laps to go when he didn’t need a second invitation to pass Viñales after the compatriot had gone wide. Lorenzo cleverly continued his race in such a way that he still had enough rubber left on his Michelins to make a final charge five laps before the end of the race to smoothly take over second place. He was consistently stalked by Rossi, but he didn’t let it shake his confidence and held off the Italian’s attack to take second place over the line, 2.740s from first. Teammate Rossi had a good start from his sixth place grid position and slotted into fourth place after turn 1, determined not to let the leading group out of his sight. With 21 laps to go, Marquez dropped back to fifth, allowing Rossi to take hold of a podium finish for the first time in the race, fuelling his ambitions even further. He hunted down his teammate and bided his time to make a move with 18 laps left, to close the gap to the race leader. 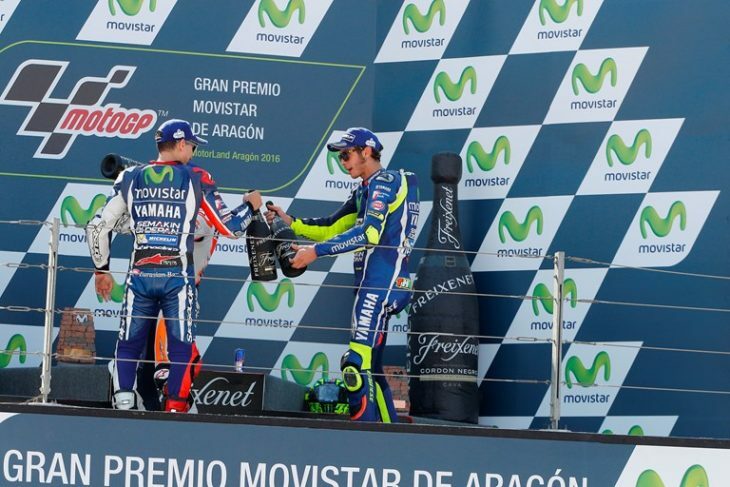 He was the first rider to drop into the 1’48s as he reeled in Viñales and went on to take the lead of the race after a block pass in turn 4 with 15 laps to go. The Doctor’s pace proved too hot for the Spaniard, who went wide in turn 1 a lap later, allowing Rossi some breathing space before Marquez made his move with 12 laps to go. Rossi wasn’t willing to let his rival go and put his head down, but he was unable to stick to the home rider and with five laps to go he put his attention towards his teammate, who pushed him back one place. The Doctor followed the fellow Yamaha rider like a shadow, but was unable to get past and took the chequered flag 5.983s behind the man in first place. Lorenzo’s superb race craft delivers him 20 points. He remains in third position, now just 14 points behind his teammate in second. Rossi’s third place gives him a total of 196 points, now 52 points behind the championship leader. The Movistar Yamaha MotoGP will next head to Japan in three weeks’ time for the Grand Prix of Japan, the first of the three overseas races. Monster Yamaha Tech3 team rider Pol Espargaro delivered a relentless performance in front of nearly 70,000 fans today at the Aragon Grand Prix which he completed in 8th. The young Spaniard impressively concluded the morning warm up in 3rd place, which left him highly motivated for the afternoon. Here, he kicked off his fight from the fourth row of the grid and bolted forwards when the lights went out. Espargaro was shuffled back to 12th place by the close of the first lap, yet he remained focused and set into a consistent rhythm as he targeted climbing back up through the field. The home hero progressed forward and by the 4th lap, he was running in 9th. Following this, he continued to inch closer to the rider ahead and on lap 16 he seized 8th after moving past Andrea Dovizioso. He then set his sights on closing down the San Marino race winner, Dani Pedrosa and gave his all before eventually crossing the finish line in this position. The 2013 Moto2 World Champion now confidently looks ahead to the Japanese GP where he will aim to clinch the leading satellite honours at Yamaha’s home Grand Prix alongside returning teammate, Bradley Smith. Espargaro was the sole rider for the Monster Yamaha Tech3 Team today after Alex Lowes, who was standing in for the injured Bradley Smith, was deemed unfit after being medically reviewed this morning following his crash in FP3 yesterday. In the accident, the young Briton injured his left foot and suffered swelling and contusion, which did not improve overnight and subsequently he was ruled out of the race.